This review was first written by me at the end of 2012 and posted to a Canadian website. I’ve added an edit or two to reflect more recent experiences. Enjoy the read. 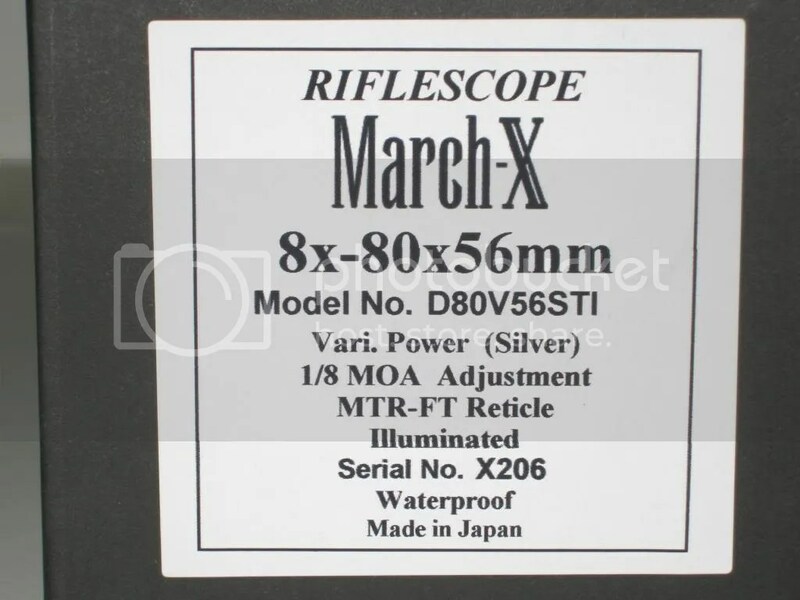 I’d long been intrigued by the much vaunted but quite elusive March line of riflescopes but what did I really know about these apparently very high end scopes? I understood that the made-in-Japan scopes were very popular in Europe, especially so amongst the UK’s F-Class and TR shooters, that their variables offered up to a ten-times power range and that one of their models had an amazingly high 80 power magnification – that’s more than many, if not all, spotting scopes, I also knew that they were expensive and that there were some rumblings about the warranty coverage and, at least here in Canada, that appeared to be a big concern especially as March was new to Canada, and therefore a relatively untried and pricey offering. According to Deon’s website the company was founded in 2004. Their worldwide distributor is Kelby’s Inc in the USA and they have quite a number of international dealers including, for the Canadian market, Spartan Precision out of Alberta. Disappointingly at the time of writing I could find no meaningful review of them either online or in print and, until recently, I hadn’t seen one at any of the clubs I used to shoot at. Not surprisingly, no local store – at least that I’m aware of – carried the March line of products. 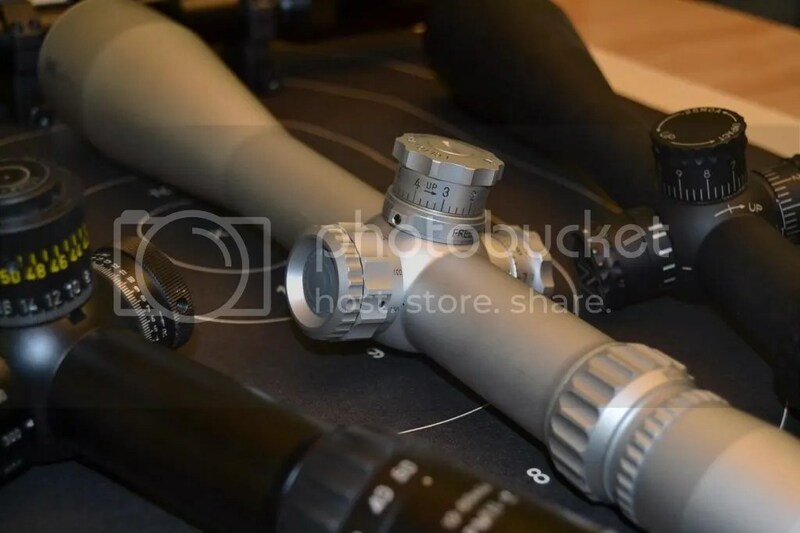 What this all meant was that, when I was last in the market for a top-end scope, I chose to buy a Schmidt and Bender 12-50×56 because, while I hadn’t seen the particular S+B model I wanted, I had seen several S+B’s and, quite frankly, S+B had such a great Worldwide reputation that I felt comfortable buying their product. By the time I got round to writing this review I’d looked through a couple of March scopes at F-Class matches and I had in my hands an actual scope. loaned to me by Spartan Precision. 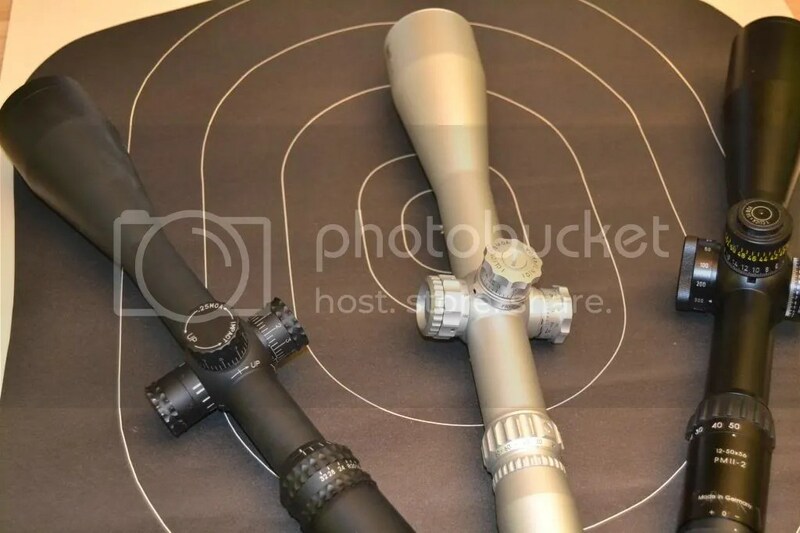 Throughout the review I chose to make comparisons between the March and three of my personal scopes – my 12-50×56 S+B, a 12-42×56 Nightforce Benchrest and a 8-32×56 Nightforce NXS as these are the kind of scopes a person considering a March purchase might well consider as potential alternatives. 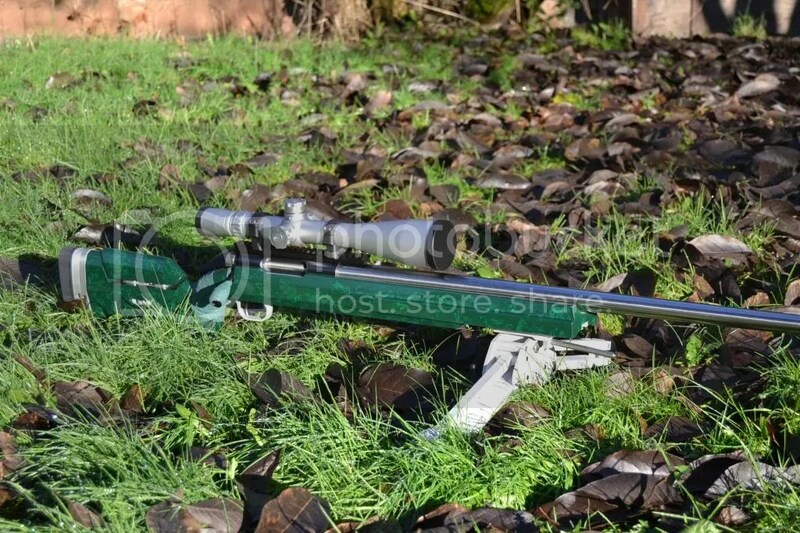 I was not planning to draw any comparison between the March and other good scopes such as the Sightron Siii and the Vortex but on one of the test days my regular shooting partner came along with his F/TR rifle and Siii 10-50×60 so, Sightron does, indeed, get a mention a bit later on. 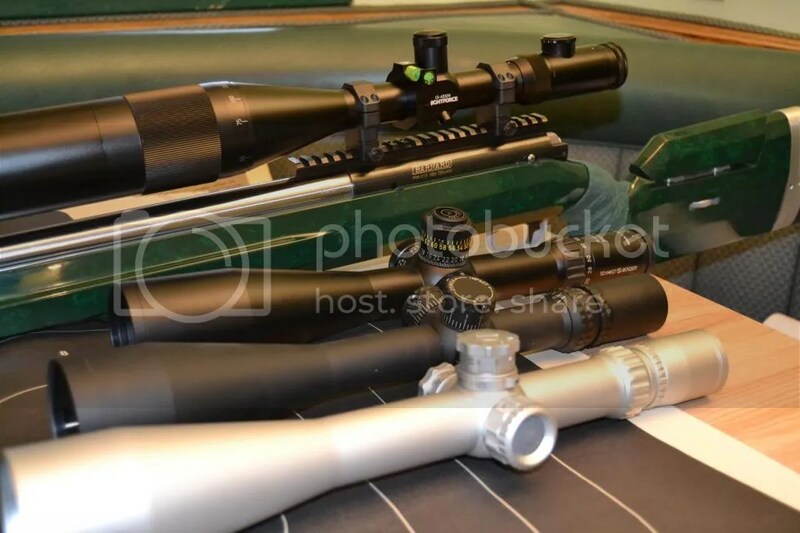 Really though it isn’t fair to talk about scopes in the sub-$1500 range because the price differential is so great that someone isn’t likely to consider such scopes when in the market for something like a March. 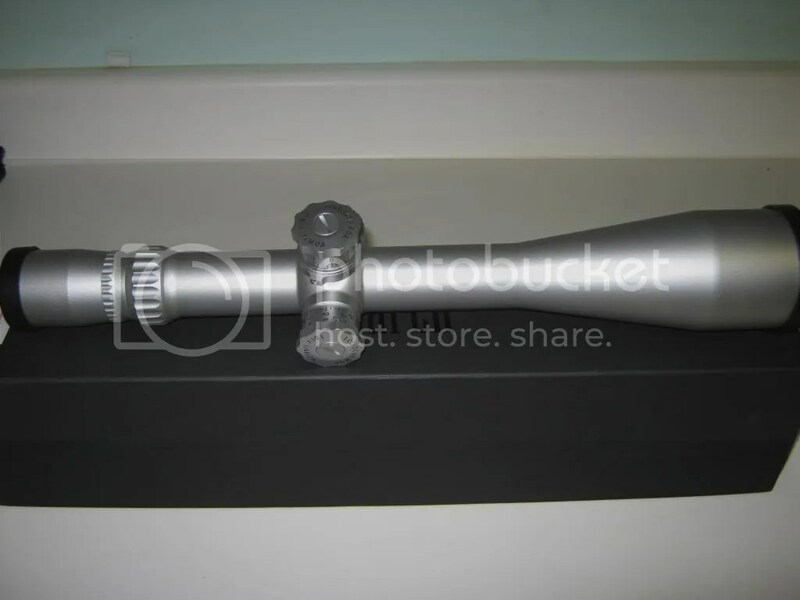 In fact you know you are in some pretty rich country when the Nightforce is the cheapest scope in the picture above . Like all 34mm tubed scopes the March appears to be quite ‘beefy’ – now this isn’t a problem for me as the lightest of my rifles is still very substantially proportioned but the buyer who is considering mounting a scope with a 34mm body ought to bear in mind that on some rifles, even some ‘Tactical’ rifles, the big-bodied scopes may look ungainly. 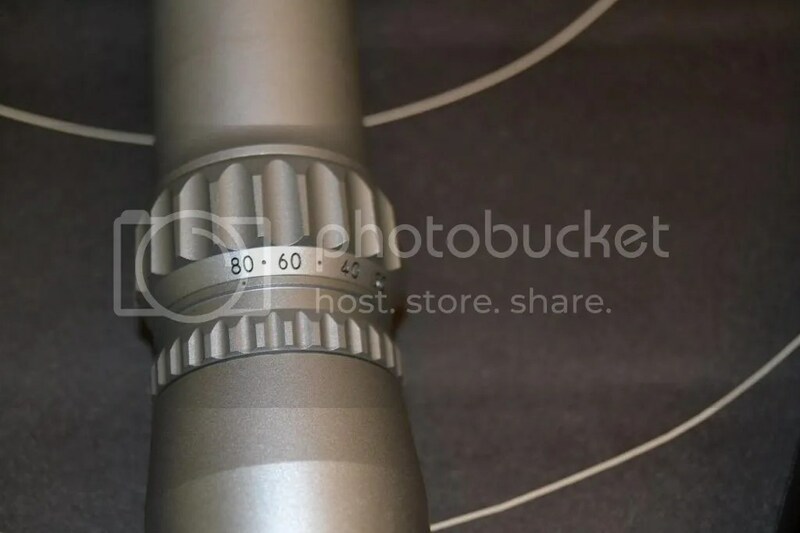 The overall length of the March is 409mm or 16.1” which is around the norm for a scope of this nature and, for the reader’s reference, the NF NXS is the same length, the NF BR is 17” and the big S+B is 16.41”. I never did find out the weight of the March scope but it felt about the same as the similarly proportioned S+B but weight shouldn’t really be a consideration unless you are planning to use this scope on a rifle for F/TR in which case ounces, or fractions of an ounce, often do count. The test March came well packaged with two lens caps – the usual plastic and, quite oddly to my mind, some custom leather (yes, leather) ones and a sunshade which, annoyingly, with S+B you have to pay extra for. More importantly to me the instruction pamphlet appears to have been written by someone with a good command of the English language and the other paperwork included a specification sheet and warranty instructions. Now, let me lay to rest the warranty question – taken verbatim from the papers that came with the scope it states: “Term of Warranty Five years from the date of purchase, for the original owner only; non-transferable.” It goes on to say that in case of a warranty claim you are to package the scope up with the appropriate forms filed out, and mail it off to Japan. So there you have it. 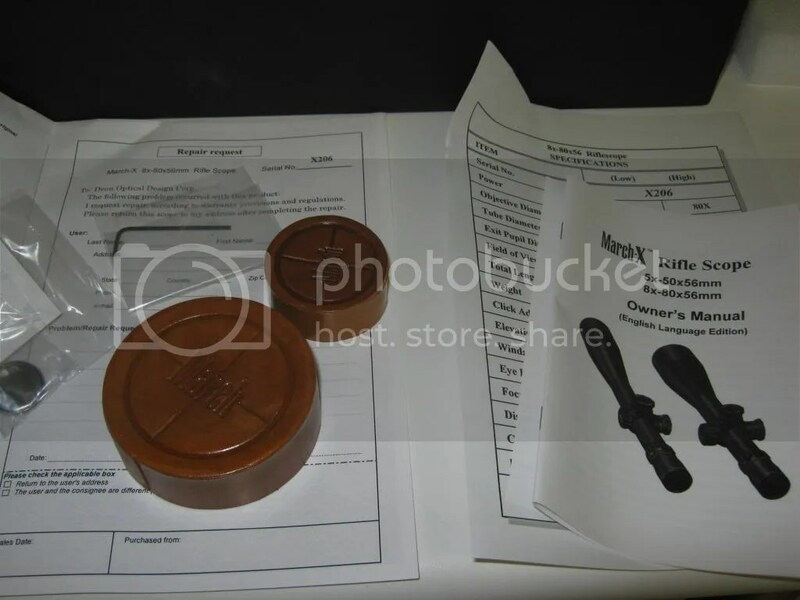 Before I leave the paperwork I must mention that while well-written the documentation that March supplied with the scope seemed a bit cheaply printed – I know it doesn’t really matter, but it just lacked the print quality of the stuff you get from, for example, Nightforce. I don’t expect a leather-bound manual, but at this price point I would like to see something more than Deon provides. Small, picky, point – absolutely but this isn’t Blunderbuss Shooter magazine so you get to read what the reviewer honestly thinks. This particular March was supplied with the MTR-FT reticule that was apparently designed by a chap named Conor McFlynn who was, in 2011, the Field Target Champion. The reticule reminds me of a less busy version of Nightforces’ NP-R1. Certainly this MTR-FT reticule is easy to look through and – at least to my eyes – there were no distractions. Reticule choice ought to be determined by the application the shooter wishes to use the scope for, but at least in my experience it is a much more personal choice than that. In fact almost all my shooting – recreational and competitive – is done at known distances so, for me, many would suggest that a target dot style reticule would be most appropriate but I’ve been that route on a 10-50×60 Sightron Siii and, as it so happens, I missed my mil-dots or hash marks even though I haven’t, for years, used a scope for any kind of ranging whatsoever. 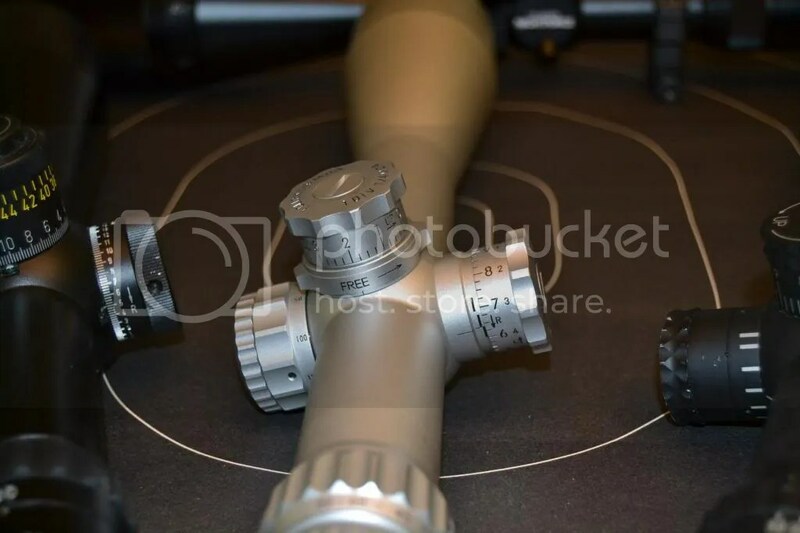 The elevation and windage controls on the March were to be found in the usual places and this scope has a side parallax adjustment which allows for quick and easy operation without leaving the shooting position. 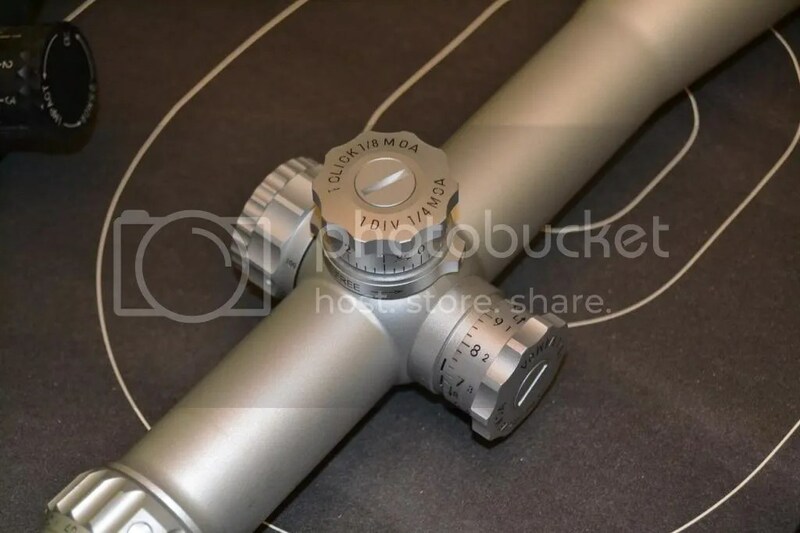 The scope under review came with 1/8th MOA click values with each dial mark representing ¼ MOA. One-eighth clicks is commonly accepted as being perfect for F-Class (if the shooter has the ability to really take advantage of them) but probably an unnecessarily fine graduation for tactical applications. One complete turn of the dial corresponds to 10 MOA and the built in elevation amounts to 60 MOA which, considering the magnification range, is quite generous and compares favorably to the Nightforce 12-42 which has only 40 MOA. March provides an interesting zero stop feature that locks up against the elevation dial. I thought this was both handy and quite simple and it was also well explained in the written material. This scope also provides for an illuminated reticule which is operated by way of a push-button on the parallax dial and reticle illumination is a feature that S+B doesn’t include on their 12-50 scope. Mounting the scope using of course a set of 34mm rings was easier than with the S+B which uses up a lot of available tube space with a beefy set of central controls. If you can mount a scope at all then the March won’t provide you with any problem. Taking a first peek through the March glass it looked very clear and was easily on par with the scopes from Nightforce but it did not have the ‘magic’ of S+B whose engineers make it appear as though their 56mm objective is actually bigger. Clarity to clarity though yes, we seem to be on the same page. A lot more observation was to be made at the range. For its first outing I had decided to mount the March on my RPA/Krieger F/TR rifle which is chambered in .308 rather than on the softer-recoiling Barnard/Krieger in 6mmBR which wore, instead, the NF BR 12-42. On day two I put the March on the 6mm and my Coyotes wore the S+B and the NXS. All shooting was done at the Mission and District Rod and Gun Club and while snow remained on the ground at the range, the weather on the first day was the overcast/rain while on day two there was some sunshine. After sighting in on both days all following shots were taken at 300 yards. The March passed the standard box text – I really wasn`t going to bother with doing this but I`ve seen other pricey scopes fail this test so I thought it a wise move – I then spent the remainder of the time shooting and fiddling with all the controls (yes, tracking was perfect throughout) as well as making direct comparisons between the various scopes for optical clarity. Lacking anything more sophisticated, all tests were done using “Eyeball, Human, Ver. 1.0“. I found the Marchs’ elevation and windage knobs to have a nice feel and an audible click and I thought them better than the S+B where I find sometimes I go an extra click or two. I can`t report the same level of enthusiasm about the side-parallax though as I felt it just a wee bit difficult to get a perfect focus. Nothing really bad, but using S+B as the benchmark I thought the March not as good – in fact it reminded me of the Sightron Siii in this respect and, since my buddy had his Sightron with him I was able to confirm that feeling on the spot. Remember, please, that because the March is one of the most expensive scopes out there, I am looking for fault and picking apart things I wouldn`t normally look to do. Back to the scope, the ocular adjustment was fine and smooth but not so much the power ring – now this may be because it is a brand new scope but I found that, especially from the prone, it was a tad hard to adjust. 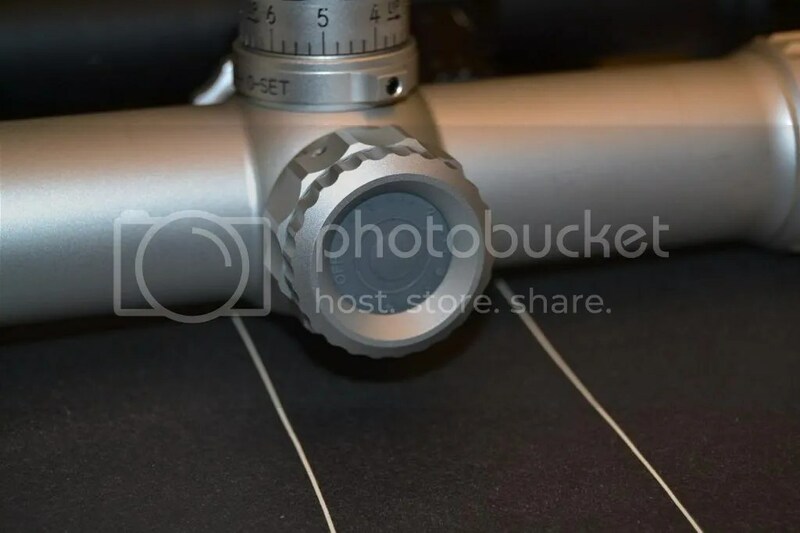 Maybe a rubberized coating like the S+B or a raised knob like on the NF BR would be helpful. Over the course of the two days I formed the opinion that the glass clarity of the March was very, very good; better even than the best of the NF – the BR – but was it as good, or better, than the S+B? It is so tough to call as clarity is, quite literally, in the eye of the beholder but I think – just think – the S+B is a teeny bit brighter at comparable magnifications. I spent a lot of time with both scopes set on 30x when drawing this conclusion and, honestly, I`d not argue with someone who said they felt it was the other way around. I said earlier that I wouldn`t compare these instruments to scopes costing a lot less but I will say that the Sightron Siii (which, by the way, I maintain is a great ‘value’ buy) – also set on 30x came off, as expected, very poorly indeed when side-by-side-by-side with the March and S+B. I say this not to knock the Sightron in any way at all, but simply to emphasise that when looking at the March we are in the world of really, really, good rifle glass. Alas for the S+B and, of course, the Nightforces there is one area where the March simply trounced them and that is magnification – the NXS dropped out at 32x, the NF BR at 42x and my favorite scope, my S+B, at 50 while the March kept on moving up all the way to the 80x as advertised on the box. Now does anyone actually need 80x power? I don’t know the answer to that question but I do know it was pretty damn cool to be able to read the fine print on my 300 yard target! True, the March lost some brightness at the higher magnifications but I don’t consider that much of a demerit when you are the only scope on the block to be able to go that high. Overall I thought the March to be the superior to my Nightforces and, at least in some ways, I found it a bit better than my S+B. However it wasn’t a clear win for the March as in some other areas I didn’t think the March to be quite as good as the S+B but the March undoubtedly has excellent glass and if magnification is the Holy Grail for you then this particular March has no competition that I’m aware of. All this goodness comes at a price though and, other than referring to it being expensive, I’ve held off mentioning the actual cost until now. 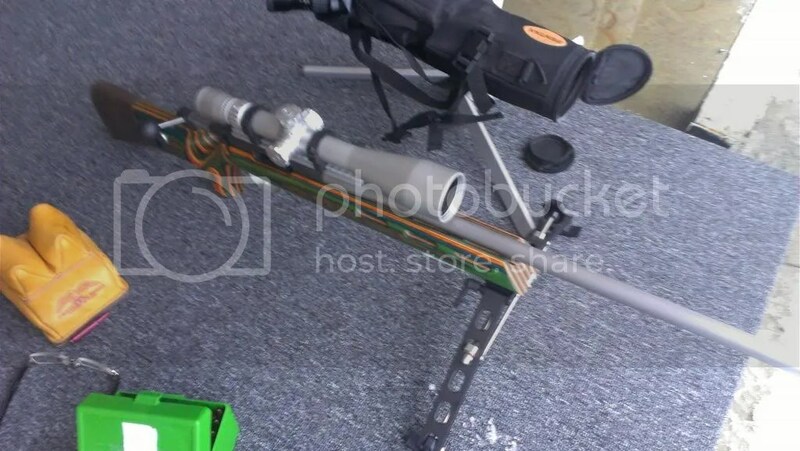 Well, for the model I tested I am advised that the Canadian retail price is $3675 (incidentally, the identical scope in the more popular black colour is $3570) which is a bit more than the S+B and lots more than the most pricey Nightforce but it sure is nice and only you, the reader, know if you can justify putting a scope like this on your rifle. If you make the decision to buy a March I think I can honestly say that, once you got over the price paid, you would be really happy with the product and that 80x power sure is neat! Note – prices were as at time of writing (end 2012). Likely prices will have arisen since this time. A last look before I packaged up and sent it back. Love your reviews Dude. Would be happy to help you out sometime. I will try mine next week with MTR-1 reticle. I wish it will beat my two Nightforces !